This article will help you understand how you can estimate the initial design characteristics of a heat exchanger. An Excel spreadsheet using the equations developed in this article is also provided. The equations are derived from a simple heat balance, and a few other elementary relationships. These equations act as initial estimates, and the results will need to be refined by more sophisticated calculations. If you just want the spreadsheet then click here, but read the rest of the article if you want to understand the theory. Consider a heat exchanger operating in countercurrent flow. and the mass flowrate of the cold stream. and the heat transfer area. Qc gives the overall heat transfer rate. 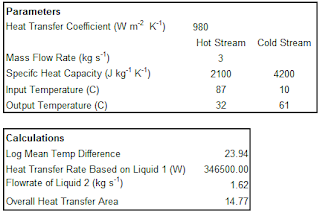 The final two equations can be easily rearranged to give the overall heat transfer area A in terms of the heat transfer rate Qc, the heat transfer area A and the log mean temperature difference. 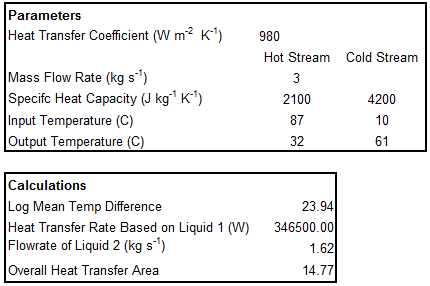 Implementing these basic heat transfer equations in Excel is easy, and no special explanation is required. The article is short and good. It would have been great if you had included the meanings of Qh,mc and others for laymen like me. Your heat transfer area is unitless? ?